During the Cerberus project, we had plenty of opportunities to meet the public and we have understood the crucial importance of communicating and educating. We therefore participated to scientific and non-scientific events, explained our project in the media and committed ourselves in making children aware of the possibilities of biotechnologies. We also carried on the development of a card game, MicrobioWorld, explaining molecular biology and microbiology in a fun way. However important were these actions at a local scale, it was frustrating to not reach more people. We therefore initiated contacts with the French Ministry of Education and we helped them to develop a pedagogic wallet distributed to all the “Sciences and Techniques of Laboratory” high schools, at the national-scale. They loved Microbioworld which will be part of the wallet. So, our Best Education & Public Engagement is not done with iGEM but will be pursued for the year to come, or even longer. Press and newspapers are great ways to reach the public and explain our activities. It is also a very good vector to create interest, especially among wannabe scientists and to prove even students can change things with dedicated commitment and efforts. It is also a very good way to prove to people with decision power that science is not unrelated to society and modern problems. To illustrate, we were able to reach the Toulouse city Mayor who sent us an encouragement letter after these articles! 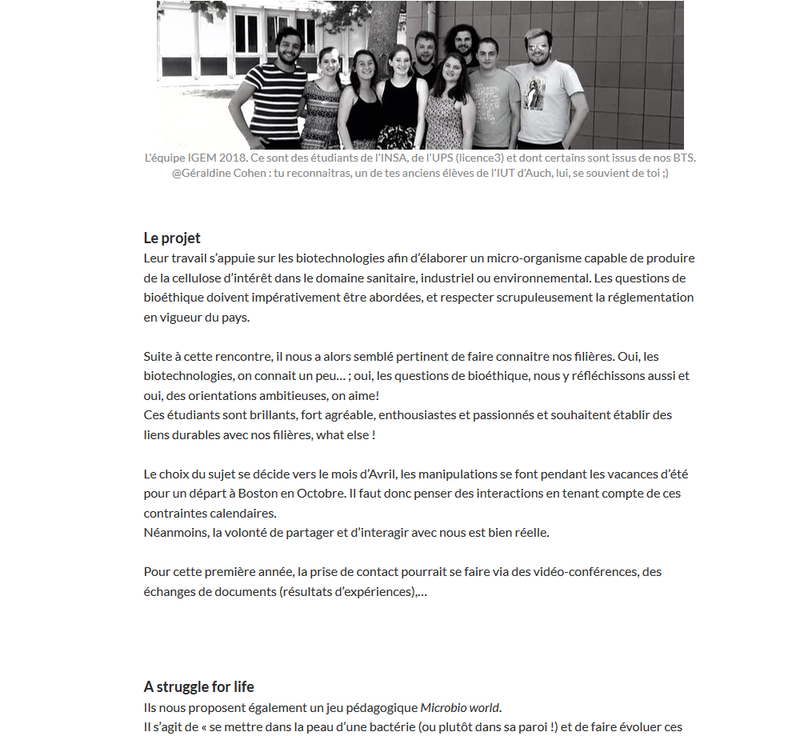 Here are the articles published about our subject when we started the communication and public engagement parts of our project. We aim to make another communication effort after the Jamboree to explain what we have achieved scientifically and the awards we obtained (well, we hope we'll obtain!). La Dépêche du Midi is a French regional daily newspaper. It is unique in that it is published in Toulouse and has 17 different local editions for the different areas of the Occitanie region. It is a very famous newspaper in the south of France and we were included in both the online and written formats. 20 minutes is a daily free generalist newspaper that aims to give quick and concise information about a whole range of topics. They wrote an online article about our project in the regional section of the newspaper. Thanks to them, we were able to reach the inhabitants of the region and keep them updated about what was happening in the scientific field. Actu.fr is a site published by the Publihebdos Group, a French press group working in the Regional Weekly Press and Local Daily Press. 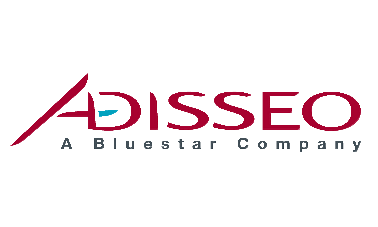 The group's objectives are to provide information and services to local communities in a humanist and democratic way. The group operates in 9 regions in France through the publication of 93 local news weekly newspapers. Crowfunding is a fantastic opportunity to both raise money and communicate with the general public. We are proud to have reached a lot of people this way and to have collected more than 2500 euros (2900 US dollars). Since we were committed to explaining biotechnologies (and iGEM!) to the general public, we looked for scientific events where our participation could be of interest. These were great times for us, from a human aspect with many meetings and discoveries, as well as from a scientific point of view (how to explain science, how to explain biology, synthetic biology, biotechnologies, iGEM, etc). Here is a summary of these events. 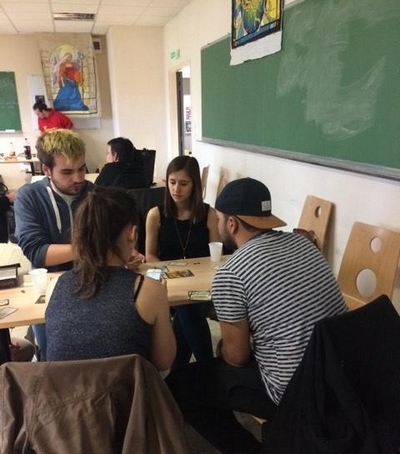 Grimoire is a club of students interested in card games, board games & role playing games, as part of INSA Toulouse. It was with a relaxed and welcoming attitude that they organised the Playful Fantasy Convention for the twelfth consecutive year. This festival is lasts for a weekend in Spring each year, and is entirely dedicated to games in a campus decorated in the theme of lost cities. Why were we at this event ? 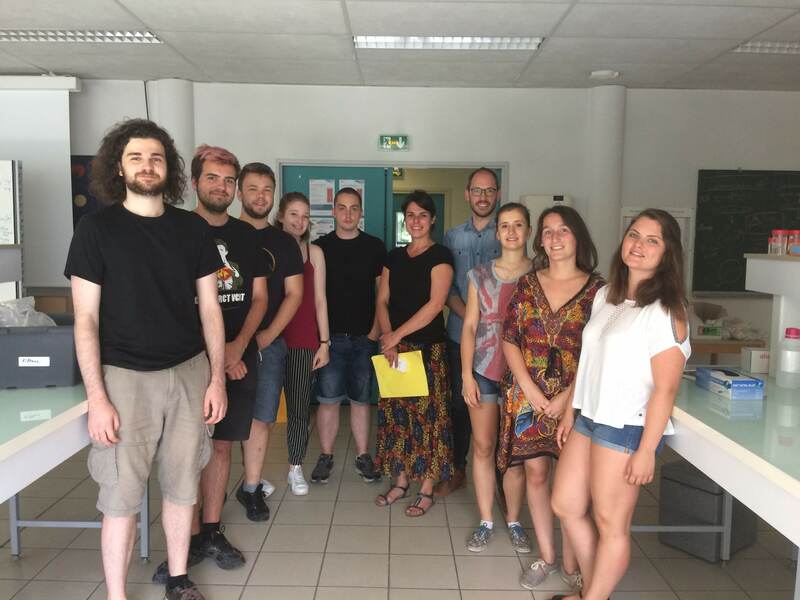 We participated in this event in order to present Microbioworld, a card game first created by the iGEM Team Toulouse 2017, but also to discuss our project, iGEM and biotechnologies with a non-specialist public. This weekend in Grimoire was intense but rewarding. We got along very well with all the members of Grimoire. It was one of our earliest human practice efforts and the first time we faced the challenge of explaining iGEM to non-biologists. It helped us a lot to understand the difficulty of such an exercice and to orient our human practice efforts. In addition, we were able to discover many other thrilling games. What is the Science Tour (Tour des Sciences)? 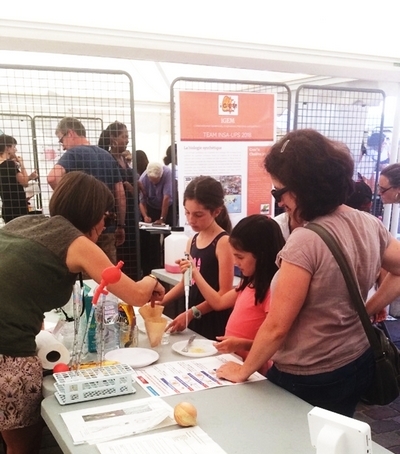 The Science Tour, which took place from March the 8th to April the 16th in eleven French cities, aims to introduce sciences to the general public in a new way, through the involvement of students and assistant professors on the theme: "The sciences of tomorrow". 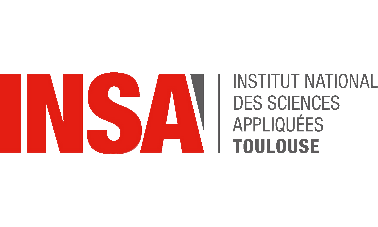 This event involves 18 science associations (researchers and various universities from all over France) in the organization of conferences and excursions to arouse interest and discussions around various scientific disciplines. 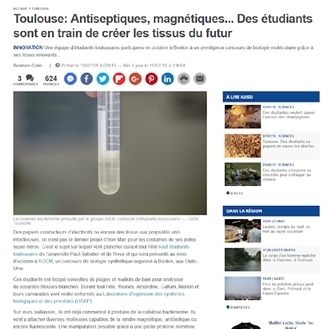 This year, the Science Tour took place in the University Paul Sabatier of Toulouse with the help of the “Corpo science”, a student organization. Why were we at this event? We were at this event in order to promote science culture to a diverse audience of students, researchers, and non-scientists, and to encourage students to be involved in the popularization of science. The activities offered during the Science Tour are intended to be diverse enough to promote Science as widely as possible, as well as the specificities of the different cities in terms of research. We also presented our project and iGEM to a very diverse population from many countries. In correlation with the theme "The sciences of tomorrow", we presented our subject and iGEM to the participants. Furthermore, we showed the diversity of microorganisms with our card game Microbioworld. This experience was very rewarding for the entire team. We were able to attend very interesting scientific conferences. In addition, we met a very wide audience that was very interested in our project. It was with pleasure that we participated in this event. ESOF (EuroScience Open Forum) is the largest interdisciplinary science meeting in Europe. 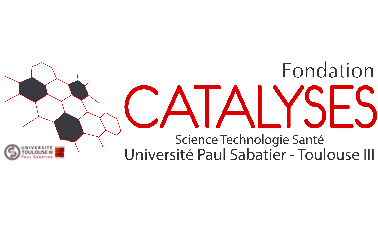 It is dedicated to scientific research and innovation and offers a unique framework for interaction and debate for scientists, innovators, policy makers, business people and the general public. Created in 2004 by EuroScience, this biennial European forum brings together over 4,000 researchers, educators, business actors, policy makers and journalists from all over the world to discuss breakthroughs in science. More than 40% of the participants are students and young researchers. 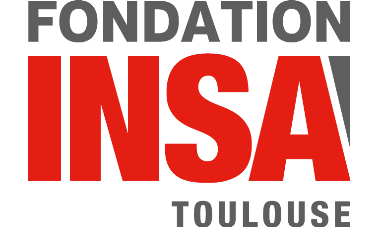 Following Stockholm in 2004, Munich in 2006, Barcelona in 2008, Turin in 2010, Dublin in 2012, Copenhagen in 2014 and Manchester in 2016, the city of Toulouse was chosen to host this unique European event for the first time in France, which took place from 9th to 14th July 2018. 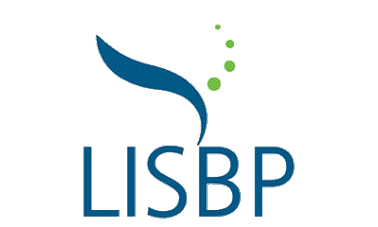 We participated in this event in association with our partner laboratory LISBP. An event of the magnitude of ESOF brings together delegates from more than 80 countries, journalists and science communicators but also conferences, workshops and scientific sessions. This event was open to the general public and more than 5000 participants attended. 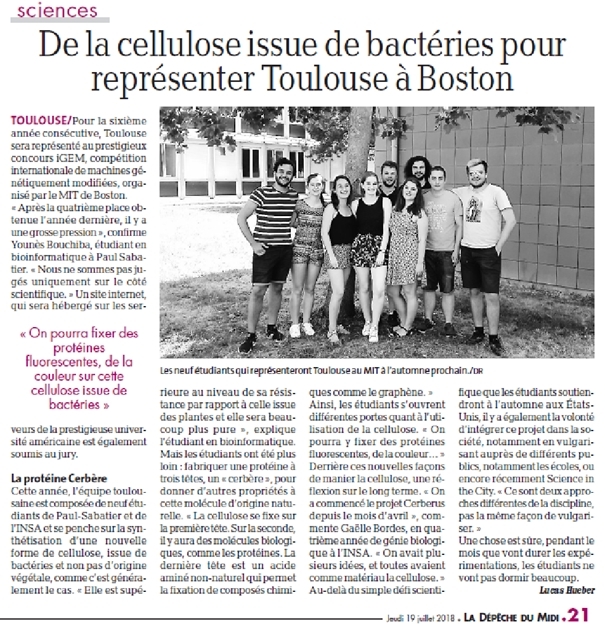 Taking part in ESOF was a unique opportunity for our iGEM team INSA UPS Toulouse to create links, discuss and debate with the scientific community worldwide but also with the general public. Furthermore this allowed us to communicate about our project to an international audience. For one week, we operated a stand in collaboration with the LISBP. We presented microbiology with 3 activities. The first one was to question people about what they know about microbiology. We used a card game to start the discussion with the public with question like: “do you think that you can adopt a pet that came from lab experiments in France?” or “Do you think that you can find GMO in human foods?”. In a second part, we performed some activities around DNA and an observation of yeasts and onion cells with a microscope. We also offered to the public to extract banana DNA. At the end of our stand, we explained iGEM and the iGEM team INSA UPS with poster presentations. This event was extremely enlighting for our team, as much for the human relations as for our personal development. It was noted that most people do not know much about microbiology but are inclined to learn new things. Our project and the iGEM in general generated very positive feedback and intrigued many people around the world. It was with pleasure that we answered their questions! Games are a fantastic support in education. That is why iGEM Toulouse 2017 developed a card game to explain molecular and synthetic biology in a gripping and funny way. This game was named Microbioworld. 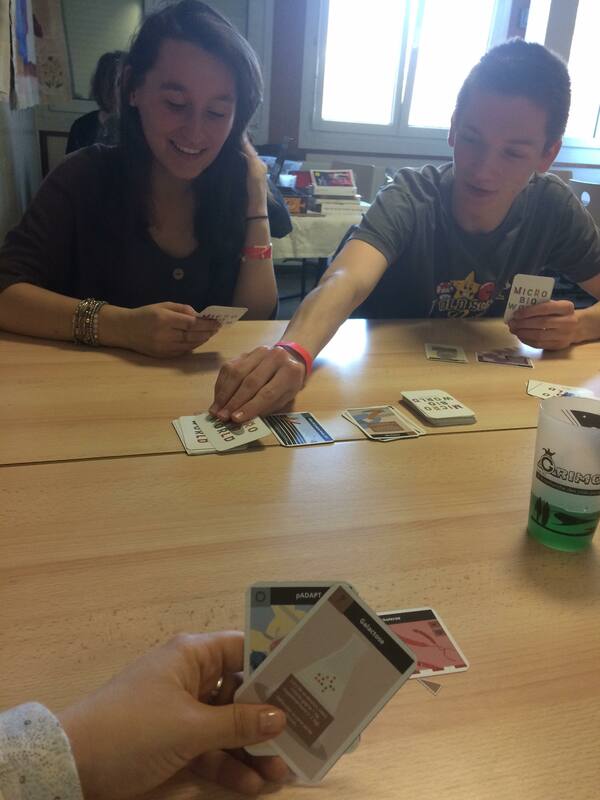 Unlike most games presented at iGEM, it is not based on combining cards like « Happy Families » or « Uno ». Its structure and gameplay is closer to « Magic: the Gathering » which allows plenty of unexpected combinations. 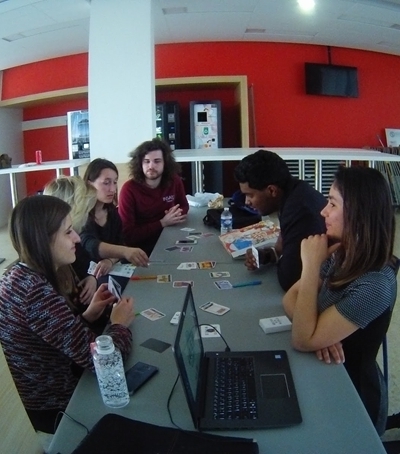 We, iGEM Toulouse 2018, were very excited about the power of this game as an educational tool and we decided to carry on its development through two main axes: improvement of the cards and distribution of the game. In this game, each player is a microorganism whose aim is either to be the first to develop into a large colony, or to eliminate all other competitors. For that, the player can choose between division or action at each of its turn. Example of actions could be changing the growth medium to a more favorable one, attacking the others with a phage invasion or protecting itself by acquiring plasmids with resistance markers (as long as it does not already have a plasmid with the same origin of replication, of course). In the initial game version, some of the actions weren't really based on real scientific concepts. The game also needed rebalancing the power of some cards to be improved. 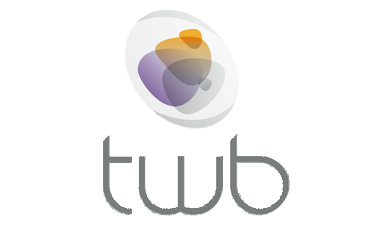 We therefore reworked it to create Microbioworld2. This required a lot of games between us and with professionals in the game business. This is how we participated in the “Grimoire” game event in Toulouse. We also met Jackson Moore, an official « Magic The Gathering » judge who kindly shared his knowledge and experience with us. Additionally, we used the game at most of the events and education activities we participated in. This year, we renewed our collaboration with Vincent Hoffmann and Julien Hypolite for the illustrations. Their work is just fantastic ! All the people who played with us were amazed with the game's significance and educational power. This was especially true for people who knew about microbiology since they were able to perceive how smart the game play is and how accurate the mechanisms used in the game are from a scientific point of view. The big question was how to avoid this game being only an “iGEM effort”. The previous team had protected the game with a Creative Common license. We could have tried to publish the game but this would require a lot of time and energy to meet and convince people, and to participate in game events at the national scale. The solution came from contacts we had with high school biology teachers. We shared some games with them and they were very enthusiastic about it, enough to talk about it to their chief Education Officer. He came to visit us and it was decided from there that the game would be part of an educational wallet designed to explain microbiology for high schoolers. It is without saying that we are thrilled with amazing opportunities that is our greatest achievement for Public Engagement and Education. 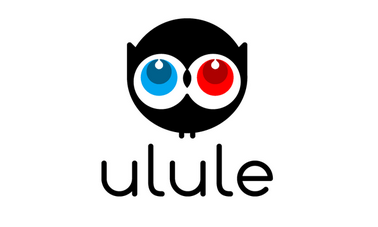 And if you visit us in Boston or Toulouse, come play with us ! Education of the next generation is maybe the most efficient way to educate the public. It is also crucial to create vocations. We chose several approaches with pupils and students to explain our work, understand how young people feel about biotechnologies and microbiology, and to help teachers with their important tasks. 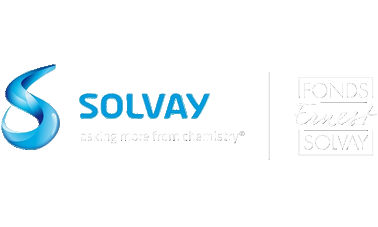 Click on the logos to discover our actions! 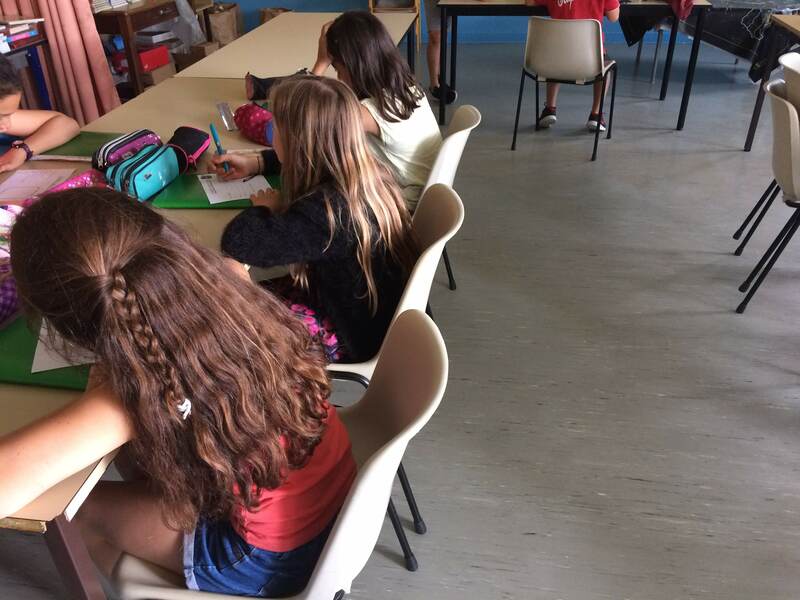 We intervened with 35 CM1 (9 years old) of Belbèze primary school in Toulouse. This course on microbes was a part of the theme “Civic education, morality and discovery of the world”. The purpose of our activities was to allow children to observe, investigate and discover the causes of natural phenomena. For this, we followed a questioning approach on the role of the researcher and the hygiene measures that he must follow. At first, we introduced ourself, then we introduced iGEM to the students. We separated the students into three groups. We brought Petri dishes, plastic beakers, a pear, a graduated pipette, a sterile bulb, gloves, a gown, safety glasses, Eppendorf tubes of different sizes, pee pots, flasks, containers to weigh, displays and distilled water. The research profession was presented through personal considerations from the children who were asked to think about a definition of research as well as the material for studying “microbes”. An important aspect was to focus on safety with a presentation of the individual protective clothing (glasses, gloves and gown). To finish, the students laid their hands before and after washing them on a petri dish containing LB + agar in order to observe the importance of hand washing. The vast majority of students showed curiosity and asked many questions. 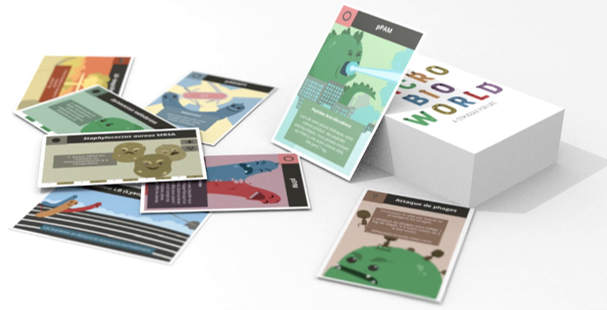 The discovery of the microbial world was also made through the card game “Microbioworld”. In teams of 2 to 4, the students played one of the 6 strains of the game. Although some rules and some concepts were not understood from the beginning, the students quickly took to the game. At the end of the game different ideas were discussed: the differences between the culture media, different resistance of microorganisms and plasmids, different characteristics of microorganisms (pathogenic or not, gram positive or negative). These ideas were sometimes simplified for the sake of clarity for this young audience. This part was more like a course in the true sense of the word. The subject of microbes was introduced by questions about pupils’ knowledge (what is a microbe, where can you find them, what do they look like). To answer the questions raised in the first section, we viewed a video on the differences between viruses and bacteria. We corrected the previous questions from the video and we clarified the misunderstandings in groups. Then, we visualized photos on a tablet (diagram of the shapes of bacteria and viruses and photos of observations under the microscope). Finally the students filled out a form where they invented their own microbe. The students were very interested in this part although it was more conventional. Creating microbes allowed the development of the imagination of the students in quiet work conditions. We started the intervention with all 3 groups in the same room. It was not a good idea and we quickly changed it! We had 2 classes of CM1 in progress, both teachers remained throughout the intervention to help us maintain good working conditions. Overall agitation was more prevalent in groups 1 and 2 because the activity was more playful. The intervention took place from 9h30 to 12h, it was not possible for group 1 to have their scheduled break. Search for optimal conditions for growth and production. Lab safety and bioethics issues. We first organized a meeting with not one but many high schools. In order to do that, we have scheduled a Visio conference with the help of Aurélien Despierris for after the Giant Jamboree. This will gather four high schools (Stéphane Hessel High school and high schools from Castres, Montauban and Albi (3 cities of our region). This intervention will be in two parts. The first one will be about iGEM, our project and all the problems that we have been challenged with. In the second part, we are going to talk about our academic study paths, how we deal with this project and being students but also about ethical aspects of synthetic biology. Because our subject is something that these students can understand, we thought about giving them some of our documents, protocols and results in order to increase their awareness of lab work. We thought about different ways to disseminate these resources. 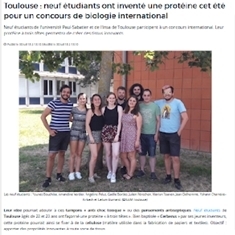 We could use the eduLab Biotech Toulouse website: the GREEN (or the academic biotechnology site currently under construction or via a dedicated mixed site IGEM Toulouse - biotech). Another possibility is through the national association of biotech teachers (UPBM), or the Eduscol ministerial site. We also gave teachers the idea to use labspace.io as a manageable and interactive labbook. This website was really helpful for our team and it can surely be used in an educational way. As an educational tool, we have remastered the "Microbioworld" card game of our fellow iGEM Toulouse predecessors. So we decided to use it. Cathy Metge came up with the beautiful idea of an educational wallet that can deliver a lot of science resources for student such as orientation tips, help in biology, professional advices and our Microbioword game to raise interest in Microbiology. 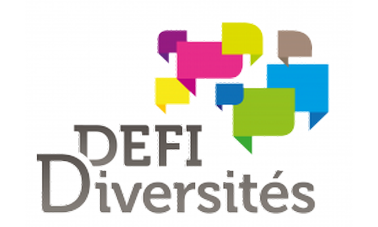 This is a really big project since it will concern all French highschools, on the national scale.  It will be diffused with the help of Philippe GARNIER and the French Educational Ministry. 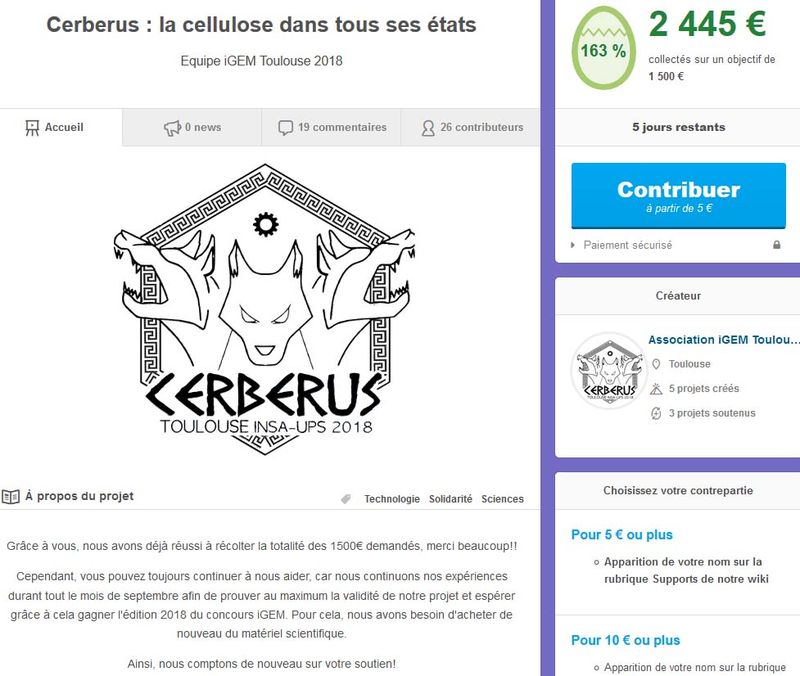 This collaboration will go beyond iGEM Toulouse 2018 and there is a strong motivation on both side to make it last. It is great achievement for us since it means that our Human Practices efforts will have long term repercussions on the national scale. The 3rd of October, we visited the international high school of Toulouse, to share our experience as iGEMers. First, we met 20 high school students, in their biology class with the head of science M. David Faure. Then, we presented our Cerberus project to the entire high school, composed of teenagers from 11 to 19 years old, and their teachers. 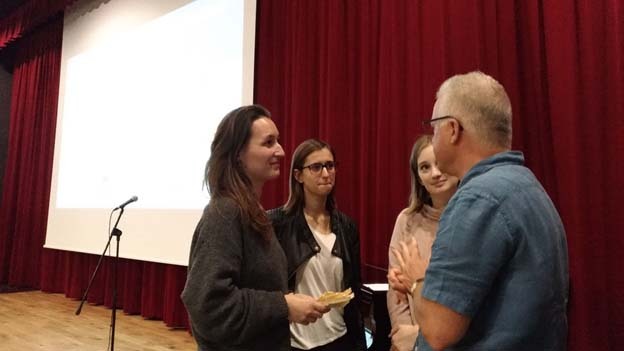 The aim of this intervention was to share our experiences, open their minds about the wide possibilities biology studies can offer, and the importance of multidisciplinary studies. We met the biology high school class of Mr David Faure. We presented ourselves and our different study backgrounds in order to inform them about the possibilities offered to them after high school in university. Then, we presented the iGEM competition and our Cerberus project, we also discussed why we chose to participate in this adventure. By speaking about the multidisciplinarity of the iGEM competition, we also alerted them to the importance of human practices and the fact that we can not create science without including human practices-oriented aspects. 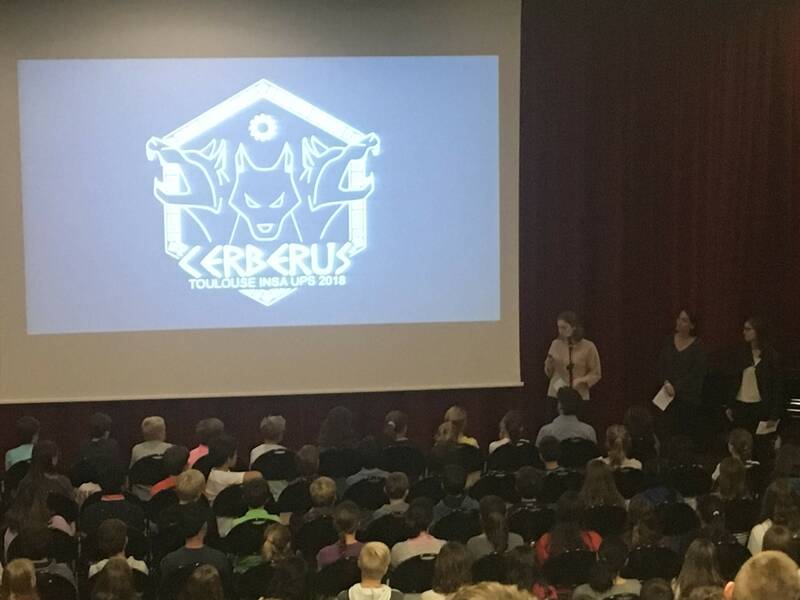 We presented our Cerberus project in front of 230 high school students from 9 to 19 years old and their professors. First we presented the iGEM competition, secondly the reasons why we had chosen to develop Cerberus and its potential. Thirdly, we explained our labwork and we showed them our funny results, they really liked pink cellulose and paramagnetic fabrics. Finally, we developed our human practice approach, and we explained how the society perception improved our Cerberus project in order to be more acceptable. Some students were very interested, and they would like to write an article for their high school journal. After the iGEM competition, we will work with them to write this article and speak about our giant jamboree results which we hope will be wonderful.